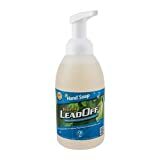 Popular soap Brands are great for dirt and germs, but they are not all that effective at cleaning off metal oxide dust. Lead, mercury, cadmium, zinc, chromium, arsenic, silver, selenium, Cobalt, and most other Toxic metals and oxides are present in many products and surfaces we touch daily. In some cases, metals can be found in the soil in your backyard, in the water supply, light bulbs, toys, tools, artificial turf, broom handles, Diaper bags, painted walls, shoes, old plastic products.Assume Toxic metal dust is everywhere. Note: Hygenall products are not a cure for metal or lead poisoning, Nor will it protect you from metals in water or if you inhale metal dust. If you suspect lead or any metal poisoning, seek medical attention immediately.